Movember is also known as no shave November. You may be wondering how this all began. Why not shave for a month? No shave November/Movember began in Australia in 2003 to raise awareness for prostate and testicular cancer. This makes sense since it is mainly known for men growing out their beards and mustaches. No shave November’s (a separate organization) main purpose is to donate the money you would use to buy grooming products for the month of November to the American Cancer Society. This organization was founded on Facebook in 2009. This month isn’t only for the men to participate in. Of course wives, girlfriends, or friends can mention this to the men in their lives, but if you’re feeling it ladies, you can join the Movember movement as well! ABC News states that “Prostate cancer is one of the most common types of cancers in the United States with an estimated 233,000 new cases in 2014, according to the National Cancer Institute. That means it accounts for 14 percent of all new cancer cases.” Over 8 thousand people have been diagnosed with this cancer in a given year and over 300 people will die from it. Next, to heart disease, this is the next leading source of death in the United States. You can post a selfie and put #Movember or #NoShaveNovember to spread the awareness of this life-threatening cancer and show off that luscious facial hair. 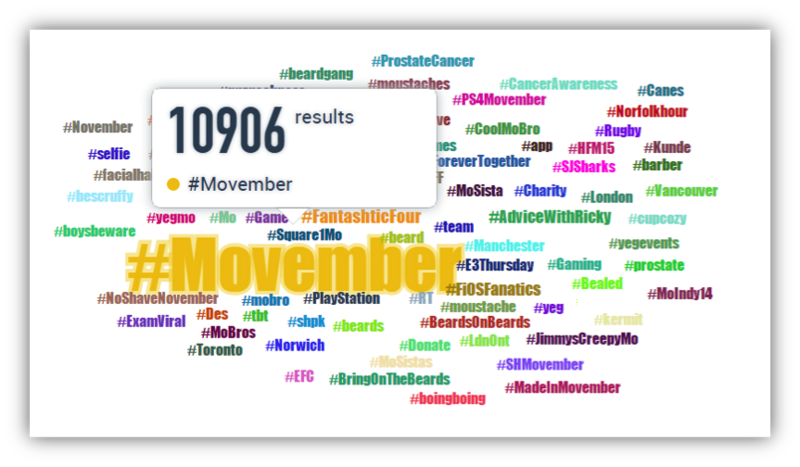 Over the years, the mention of #Movember and other mentions like it have grown. I had no idea that “No Shave November” had an actual meaning behind it and one that is quite serious ! Great post ! I found this blog post to be super interesting! I have always heard about No Shave November and knew it was to raise awareness for prostate cancer but it was very interesting reading about the history behind the movement! I also really enjoyed that you pulled information from various sources such as news outlets, social media, and institutes. Great post! I learned a lot from this article. I had no idea prior to reading this why people stopped shaving for the month of November. This is a really good cause, and I am glad that the popularity of No shave November is growing. I also appreciate your use of the meme with a beard cropped on it. The use of that word graph was a good visual to see the movements prominence. Great job! This is really interesting! I never knew that the No Shave November movement started as a way to raise cancer awareness. I always thought it was just another one of those “internet things”. Lately there have been lots of funny “No _ November” memes, so I think more people should read this article to learn about the origins of the whole movement. This was a really good article for someone who didn’t know what Movember was and those that did. I like how you incorporated images that caught my attention. There were some interesting facts as well. I did not know that it originated in Australia in 2003. The one thing that I think that you could have done differently is a more updated statistic of the new cases for testicular cancer. I’m sure the number of cases have gone way up in 4 years. Otherwise, great article and great read! I think that it is very important that people start to learn more and more about why people are doing no shave November. I asked my roommate if he knew the reason why people do no shave November and he had no idea. Most people don’t know about it sadly, which is why I am glad that there is a post about this. Spread the word as much as possible and let people know why we really grow our beards out! Great post overall! I was not even aware of the fact that no shave November originated in Australia. This article was useful in the fact that you clearly described the origin and background of No-Shave November. I liked the detail and statistics that you used within this article expressing the facts of the number of cases within the US. Great post! I’ve always wanted to grow a good beard, but i guess it takes time. I don’t have the patience to wait for it to be long, plus its too scratchy and itchy! Plus food gets caught in it, no fun. Maybe one November I will do it. But this november isn’t the month, maybe next year year. Never knew that these were the origins of these movements. I also thought that No shave november started earlier than 09′ so its crazy to find out it was that recent. I didnt realize that there were efforts behind no shave november, so since its due to prostate cancer which is actually a more common form of cancer I back this 100 percent! This post was so interesting! I have never thought about why no shave November started or what the purpose of it is. I had no idea it was to create awareness for prostate cancer. My whole life I have been convincing the guys in my life to not participate in no shave November because I did not like the way it looked on them. However, now I might try encouraging them to participate in order to help create awareness for the issue. I might even take a selfie with them and use the hashtag #NoShaveNovember. No shave November is the best! Like you said, it gives us guys a reason to see what kind of a beard we could grow if we really tried. 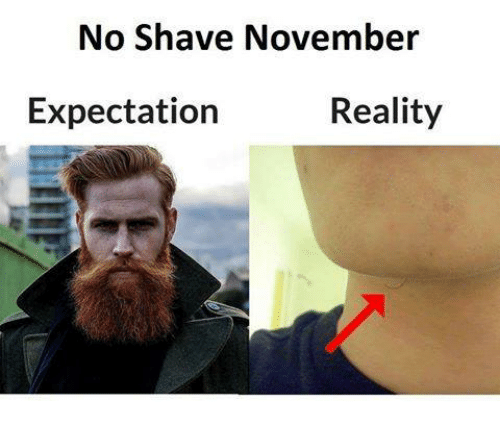 Sadly, it is a disappointing month for some when they, even after November has ended, say, “give it a few more days, it’ll be fuller” and realize their mountain man beard may not be quite ready yet. Still, it is for a great cause because testicular cancer numbers are rising and there should be more awareness done to educate people. What is crazy is that I do not feel people realize the history of how No Shave November even started and that is now a trend that I feel does not generate as much money as it could for prostate cancer. If the awareness of its main purpose and goal was made more aware to the younger generations, I think it could be very helpful in raising money for the actusl cause instead of just for fun. When I first saw the title for this post, my attention was caught immediately. I started laughing and thought it was going to be just a funny entertainment piece but it was very informational. I had no idea that No Shave November started as a way to raise awareness for cancer. Very insightful! I had no clue this is where No Shave November! This is an awesome way to raise awareness. Thanks for sharing. I really enjoyed readings your blogpost, Jessica. Thank you for addressing such an important disease. Movember is widely known, mainly for its funny memes and guys saying that they do not have a girlfriend anyway that can complain about the beard. Only a few know the trend’s origins. We should spread more awareness for this special type of cancer and not only shave off our beards, because it is fun. I appreciate your post. I did not realize the origins of the No Shave November Movement, but I was aware of the causes it was meant to benefit! It is difficult for some fellows to grow a commendable and worthy beard or mustache. The struggle is real. As a beard bearer I admit that I have never been interested in the Movember because for me it is out of question that I shave my beard that I have waited years to have it. But this article has allowed me to understand its origin and purpose through all of this. 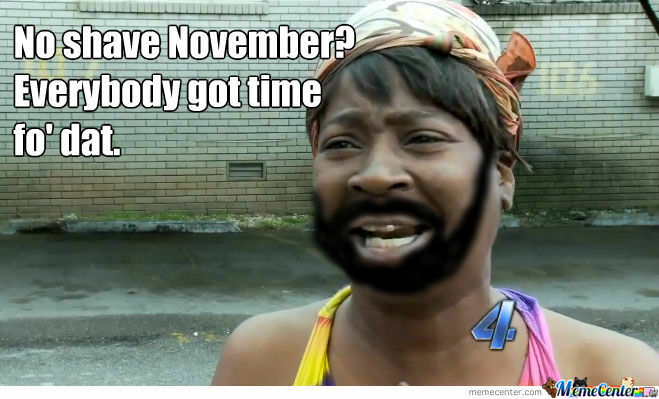 But despite this for me this month of November will be a #NoShaveNovember! This blog is great! It definitely had me laughing out loud during some points and I normally do not do that! I have heard of a lot of people participating in No Shave November but I never really knew what it was for. At my high school (several years back), all of the male teachers would participate in No Shave November in a competition with each other – whoever shaved their beard first was subject to shaving a design of the other teachers’ choice into his beard. It is a fun tradition for a good cause! I enjoyed reading your blog post. I also participate in no shave November. It’s definitely a fun thing to take part in. It can bring out competition for who can grow the biggest beard. I try to participate every year. I really enjoyed this post for a few reasons. Besides it being very well written, it is informative. I feel like a lot of people hop on the bandwagon of No Shave November and might not know exactly why people don’t shave through the month of November. Also while informative, it was light, easy to read, and had some humor with the pictures! I was familiar with No Shave November before reading this blog, but not the fact that the main purpose is to donate the money you would use to buy razors, blades, shaving cream, etc. to the American Cancer Society. I also was not familiar with the term “Movember” so I learned quite bit from reading this blog. I think it would be interesting to see how many people participate in No Shave November and make it through the whole month without shaving! Great Title, and good content in the blog with good memes to keep the reader interested. I have always wondered where no shave November came from. I thought it was just something that was done for fun. I find it very cool that in 2003, Australia started No shave November to raise awareness for prostate and testicular cancer. I really enjoyed reading this blog post. I did not know that “No Shave November” began to raise awareness for prostate and testicular cancer. It does make sense though because of men, they do grow out their facial hairs in November. At first, I assumed you misspelled the word “Movember”, did not know another name for “No Shave November”. I found that it was fascinating. I think no shave november is a fun activity for guys. As someone that participates in NO shave November and Mustache March I believe this a fun activity for people. No one cares what your beard looks like grow it out just for the heck of it. I also think its a great way to talk about prostate cancer, I think more people should be educated on the topic. I thought this was very interesting, I never actually knew the history behind no shave November. I personally am not participating in no shave November, but regardless I still think it is a great way for men (or women) to not only grow out their facial/body hair but to also raise awareness for prostate and testicular cancer. I always just thought this tradition was something men did for fun once a year but it’s great to know that it is actually for a good cause. This was a really great and informative post! Great post about no shave November! I never knew the real reason behind the idea all of this information about it was very insightful. One part I thought to be really helpful was in the last paragraph with the statistics about prostate cancer. Prostate cancer is one of the leading cancer diagnoses for men and this post it a great step towards more awareness. As a guy who has had a beard for over 6 years, this was a good post to read! I actually feel bad though because I had no idea that there was a reason behind no shave November. I actually thought it was just a thing that people made up, but I’m glad that i am finally aware of its true purpose! I really enjoyed this insightful post on No Shave November. I have participated in this trend the past couple of years but never knew that it started in order to raise awareness for prostate and testicular cancer! This makes me even more dedicated to not shave during the month of November. Thank you for the new knowledge on this topic! Your article is very well written and easy to follow. I found this article to be relevant and also provides information that people may not be aware of. Yes, most people know about “no shave November” but, often times people might not know why this movement began. I personally, was not aware that this was all to promote prostate cancer. I personally didn’t know no shave November was a real thing. I thought it was just something girls came up with to not shave in the winter but it was interesting to find out where it originated from. I like the fact that No Shave November is something that is meant to raise awareness for prostate and testicular cancer. It’s nice to see it is for a good cause. I’m glad I can now say I know where no shave November originated from. That was really interesting! One thought I had about the whole thing is that this kind of event is very similar to the ice bucket challenge that happened several years ago. It’s great that there’s an incentivized challenge to encourage donation. However, I had no idea that you were supposed to give money in place of your hair products. I only knew about the month of not shaving. It might be an important marketing move to emphasize the step of giving money towards the cause so others don’t run into that misunderstanding. Your blog enlightened me on the true meaning behind No Shave November. I truly did not know that there was meaning behind it. I have always thought it was just a fad thing to do since it made sense with the name of the month. I enjoyed your post in all truth. As a woman, I actually am also participating No Shave November! I think not shaving is really empowering and I’ve actually been loving having my hairy body especially to support such a great cause! It’s definitely a little looked down on for woman to have hairy armpits or legs but I feel great! Jessica, I had no idea that no shave November started to raise awareness for prostate and testicular cancer. I had always thought it was just some viral type of cultural, silly, “movement”. I like to participate in no shave November, mostly because it also keeps me warm! Thanks for the information! I will not be participating, as I still am unable to grow enough facial hair to distance myself from some middle schoolers. Haha! I have always wondered why guys choose to participate in No Shave November. I had no idea there was a true meaning behind it. This was such a cool article to read and also cures a lot of my curiosity as well. I wonder if most men know this too or if they just join in because it is such a popular trend. I also enjoyed the humor you added in about how they get to fulfill their facial hair dream.. It’s so true! I never knew the significance of No shave November till now. Since this was a tradition just about every year for me I really got into the manly event that took place every year. This was fun way for me and my friends to show off or make fun of one another but to learn the significance of it makes it such a great cause and makes me want to participate every year! I had no idea that was what no shave November was all about! I’ve always loved it and thought it was a funny way for guys to grow our their facial hair “for a reason”. They really are fulfilling their dream and they can’t get too much backlash since it is a movement.